Even if you don’t believe the story of Christmas, you can partake of the Christmas happiness and good cheer. It is a time where people are nicer than usual and their families take priority over other things. These you can do, no matter what you believe. “The Value of a Smile at Christmas” is a story so appropriate for now. “It costs nothing, but creates much. “It enriches those who receive, without impoverishing those who give. “It happens in a flash and the memory of it sometimes lasts forever. “None are so rich they can get along without it, and none so poor but are richer for its benefits. “It creates happiness in the home, fosters good will in a business, and is countersign of friends. “It is rest to the weary, daylight to the discouraged, sunshine to the sad, and Nature’s best antidote for trouble. “Yet it cannot be bought, begged, borrowed, or stolen, for it is something that is no earthly good to anybody till it is given away. “And if in the last minute rush of Christmas buying some of our salespeople should be too tired to give you a smile, may we ask you to leave one of yours? Remember those who are working long hours during the holiday season. Remember those who are far from home. Remember those who have lost someone and are facing Christmas without them. Remember others. Don’t count calories from December 15 to January 2. Don’t be unhealthy, but celebrate the holidays. Mend a broken relationship with a friend or relative during the holidays. There are people in your life who are more important that hurt feelings. Take a basket of Christmas goodies to a notoriously grumpy neighbor. Be nice to sales personnel. They are probably wearier than you are. Make an effort to attend every Christmas party and program you’re invited to (those that cost money don’t need to be included), even if you can stay only a few minutes. Place your children’s stuffed animals under the Christmas tree as a welcoming committee for Santa. Remember that the loving holiday spirit in your home depends more on the words you speak than on the gifts you give. If someone disappoints you this season, don’t give a lecture. Give acceptance and forgiveness. Fill your house with the holiday fragrance of cloves, orange peel, and cinnamon sticks simmering on the kitchen stove. Let go of a problem you can’t solve. Enjoy the season. Hang a favorite Christmas tree ornament from your car’s rear – view mirror. Don’t forget our feathered friends during the holidays. Spread peanut butter on pine cones, then roll them in bird seed, and hang them on a tree near your kitchen window. Wait until Christmas morning to place the infant Jesus in your Nativity scene. Instead of using a traditional Advent calendar that produces a treat for every day, this year make a reverse Advent calendar. Find a box and on every day of Advent add an item to it that can be used by a family in need, such as canned food or toiletries. After Advent, donate the box of items to the homeless shelter. This is a great way to refocus the season on giving rather than receiving. Here in Guymon you can donate to the Tree of Love at the Heritage Community Nursing Home. They are taking donations that help with dental work, medications, glasses, nursing supplies, rent assistance, hearing aides, clothing, and more that is all related to elder care. For more information, call 338-3186. 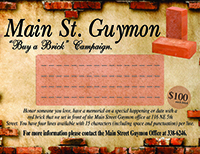 You might want to help with the Lions Club Shopping Spree for Guymon’s needy children. The spree is on Sat., Dec. 16. If you would like to help the children shop, come to the Methodist Enrichment Center at 6th and Quinn by 7:30 in the morning. You will be bused to the Ambassador for breakfast and then to shop at Walmart. The club is also taking donations for the spree. Contact Charles Michaels at cmichael@odot.org. Or call Colleen at Ken Lane Insurance. Anytime Fitness is doing a Christmas Toy Drive up to Dec. 8, when they will be added to the toys gathered from the Christmas Cheer for Children. The Christmas Open House happens on Sat., Dec. 8 from 5 – 9 pm and includes a Christmas Tree Lighting with singing at the courthouse, carriage rides, the YMCA Polar Express for children up to 12 years in age (cost is $2) at 502 N. Main. And secret elves out all evening. The Shop and Dine is also taking place that evening at Merle Norman, WOW SPC Boutique, Golden Crown, Beauty and the Beast, and others. Take your TCEC Coop Connections card and see what deals you can have from it! Whatever you do this holiday season, do it with a smile and an open heart.